The event kicked off with a session by motivational facilitator, Kevin Parr. Kevin’s highly interactive session had delegates racing to sign signatures, comparing arm spans and speed dating. It certainly helped to put everyone in the right mindset to think out of the box and challenge their norms. Next up were three delegates from CUBO’s aspiring directors programme, who gave presentations about three very different, but equally interesting projects taking place at their institutions. For many, the highlight of the afternoon, was the Big Brand Debate. CUBO were delighted to welcome Andrew Hesketh of Greggs and Jason Mumby of Costa Coffee to join Matt White, Chair of TUCO, and Amanda Shipley, University of Wolverhampton, to the panel. Giles Poyner chaired a lively debate around the question: are high street food and beverage retailers better than university brands? The debate really got to the heart of some key issues involving these two big high street brands, including student choice, pricing and fair trade. The session started some interesting discussions that CUBO and TUCO will take away to progress. For the evening entertainment, guests were treated to an innovative cocktail demonstration (and very important sampling!) provided by Welbilt. By mobilising their latest food inspired technology, Welbilt were able to service and provide cocktails and canapes for over 80 delegates. The Peach Batchida and Frozen Margarita, along with “some of the best canapes I’ve ever tasted,” gushed one of the guests, got the evening off to a very good start. The following conference dinner, provided by the University of Wolverhampton catering team, was equally delicious. During the evening event, CUBO said goodbye to Emma Furnival who stepped down as CUBO chair after two years in post. 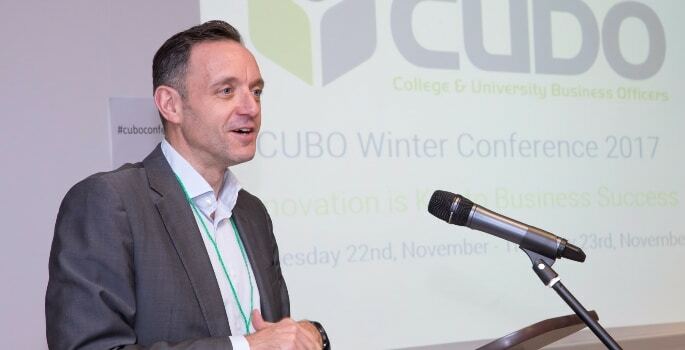 Chair elect, Stewart Ross, University of Leeds, was formally elected as the new Chair at the CUBO Board meeting. Stewart said: “Emma has been fantastic in leading a period of change for the organisation as Chair for the past two years, we are most grateful for her leadership and the commitment she has made to the sector. As the new Chair, I am looking forward to the opportunity of building on the foundations she has put in place. Emma stepped down from her role as Chair on leaving her post as Assistant Director, Estates and Facilities at the University of Wolverhampton. She thanked colleagues both on the Executive and wider membership for the support they had given her during her time as Chair. Thursday morning started with an inspiring look at the future of IT from Christine Sexton. This was followed by ex-Chief Exec of Virgin Rail, Tony Collins, sharing some very interesting thoughts and experiences of how to get the best out of people. Jan Capper, CUBO Chair, came next, with an overview of her vision and plans for future CUBO strategy and ambitions to develop the organisation. Sarah Holt and Tara Nolan of Student.com talked about how they have had to be innovative with their communications to stay relevant to their international audience. From the rise of Wechat in China to Live Chat, Whatsapp and Twitter, Sarah and Tara talked about the importance of engaging with students on their preferred channels and the pitfalls of underestimating rescources before committing to a new channel. The final keynote speaker, Robbie Bargh, a well-known innovator in the hospitality sector, ended the conference on a high note. Robbie’s fascinating whistle-stop tour of the next big thing in hospitality covered the rise of veganism, nitro coffee, open kitchens and laboratories, and the emotional experience of eating and drinking. It was a high note to go out on, everyone left talking about Robbie’s ideas and in true CUBO style continued to debate the subject with colleagues in taxis and on trains for much of the way home.